Music has played a powerful role in history for many centuries. It has the ability to affect people and change the way we think and feel. Our imagination is brighter and minds are sharper because of it. Greek philosopher, Plato describes the gift of music as giving soul to the universe, wings to the mind, flight to the imagination and life to everything. This is especially true for Katrina Neal who has had a long affiliation with music since she was born. Her earliest memories date back to her Mother playing old 78 vinyl records as a child. “We would sometimes crank up the old gramophone to play the 78s. There were 33 ½s and the 45s, which were played on the turntable. Music was always playing in our house growing up. We had a family piano, which my sisters and I tried to play. My favourite music was from the 60s and 70s era,” Katrina says. “We saw David Cassidy. 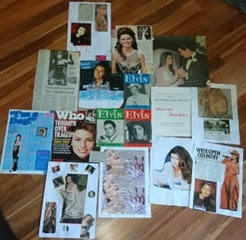 He was a teen heartthrob, loved and adored by millions. I remember him energetically bounding on stage wearing a white jumpsuit, red shirt and white sneakers. Handsome, happy, smiling, oozing charm and singing all the favourite songs we loved him so much for,”Katrina expresses. Katrina, her mother and sisters were all deeply shocked and saddened over David’s passing last year. “We just loved him so much. My youngest daughter gifted me the complete box set of the Partridge Family this year in his honour,”she says. When Katrina began her nurse training in Sydney back in 1975, she would listen to her little transistor radio, tuning in the local stations. Katrina loved hearing the top 40 hits from the likes of Chicago, The Eagles, Smokie, Suzie Q, Jon English, Rod Stewart, Gloria Gaynor, David Bowie and Cher, among many, many others. 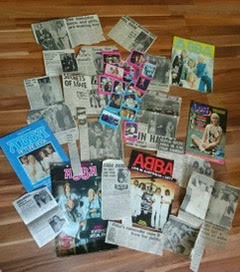 “Without a shadow of a doubt, ABBA dominated the charts with hit after hit. They still enjoy astounding success to this day. I’ve Been Waiting for You was the first ABBA song I ever heard in 1974, recorded 44 years ago. It remains a beloved song of mine to this day,” Katrina remembers. When ABBA released a new album, Katrina would be one of the first person’s in line at the record store, waiting to purchase. 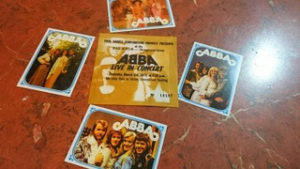 Since ABBA’s amazing tour, Katrina has had the privilege of attending many concerts with her husband and some with her daughters. Her musical dreams came true after seeing Stevie Wonder, Lisa-Marie Presley (whom Katrina saw with her sister) Rod Stewart, Cher, Neil Diamond, 1927, Jimmy Barnes, the X Factor concert, Kelly Clarkson, Maroon 5, Paloma Faith, Tina Arena, The Drifters, Herman’s Hermits, Jessica Mauboy, Boz Scaggs, Ol’ 55, Donna Summer, Elton John, Tina Charles, John Paul Young, Bon Jovi, Springsteen, Guy Sebastian, the Motown Experience, the Countdown Spectacular, Jon English, Marcia Hines and the 2018 Australian Country Music Awards. Her love for music runs real and deep, and had grown stronger when she met her future husband, Keith, a competition ballroom dancer, who also loved music. Forging a life together, Keith and Katrina passed down their musical knowledge and deep love to each of their three girls. Playing music on road trips and weekends became a tradition, and a very special, everlasting memory in that household. Katrina’s youngest daughter is closely affiliated with music and the music industry. Her love obviously comes from her parents, and she is eternally grateful for their influence. “I am soon to see Cher once again, this time with my youngest daughter who is now 21. The first time I saw Cher, my daughter was young. She is an avid music lover and is so incredibly excited for the opportunity to go with me, as its 13 years in the making,” Katrina remarks. Another dream coming soon is the fact that Katrina and her daughter are going to see Shania Twain at the end of the year. Katrina has adored her music since the early 90s. Shania’s music was first introduced to her daughter as a baby, and she grew up loving her, too. They are beyond excited and are really looking forward to seeing the Canadian songstress. Music is an amazing way of escaping reality. Its a girl’s best friend and that is especially true for Katrina. In her relaxation time, she loves nothing more than putting her earphones in and listening to whatever music takes her fancy. There is always a song that describes her situation and her life. Music is the one constant thing that is always there when people aren’t; its one of those indescribable means that touches the core of every soul.